Now's your chance to join NCIS Abby Scuito for a highly caffeinated drink in your own Caf-Pow Cup! Abby helps a team of larger-than-life colleagues solve grisly crimes for the Naval Criminal Investigative Service, and she loves a mean cup of caffeine. The NCIS Caf-Pow Cup is a cool little bit of obscure pop culture and matches the cup Abby drinks from on the show. 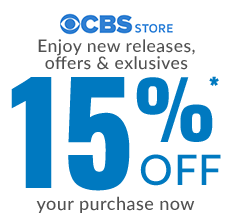 It's a great addition to a bundle of NCIS gifts for the ulimate fan. Great quality.. arrived quickly... we r huge ncis fans.. this is such a clever gift!! I have not used it yet but I wanted an Abby memory. It looks just like the one she used on NCIS. Still miss Abby even though you have an very good replacement. The cups are amazing. I am a total Abby fan. It is fun to use and pretend I'm drinking Caf-Pow. Thank you. I love it. Love this cup! It completed my daughter's Halloween costume as Abby. Nice and sturdy. 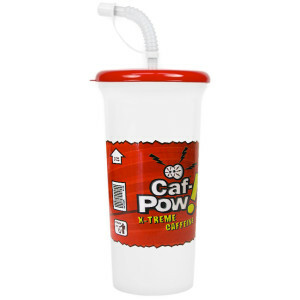 I really love the Caf-Pow cup. I have always wanted to have the cup that Abby used on the show and now, I have one!! I like the fact that it is easy to clean and holds a lot of drink. I had read that someone had wished it was the size of the cup that the delightful artist Pauley Perrette had on the series. I agree!! Less times that it needs to be refilled but proud to own a piece of television history. We need more Abby items!!! I love the sturdiness of the cup. The Caf Pow logo is awesome. I also love the fact that the straw is bendy and I like that the straw a little cap on it to prevent spills. Now I'll always have a bit of Abby with me! Also would Love to see the the larger size cup like it is on the Show...!!! Dedicated to Great Writing and Fabulous Actors and Actresses. Sorry the have to live the Gossip..!!! Thank All of you at C.B.S. It makes caffeine caffier. Raises workplace productivity to a frantic level. Awakens portions of the brain not often used by humans. Bright white and red make it easy to find in small enclosed spaces, such as coffins. It does what it's supposed to do. There are a couple "Easter eggs" in the artwork but I won't spoil the surprise. I would love to see a replica that looks more like the "big gulp" cup shape as seen on the show. This is fine for a sippy and all, but it doesn't look like a convenience store styrofoam cup; ya know? My husband and I both love our CAF-POW CUP it is a great reminder of Abby. There is nothing I can say but all good. Abby you are missed so much and we do hope you pot in sometimes. I had my first coffee from my Caf-Pow cup. One Table spoon of coffee and two table spoons of demerara sugar. It was delicious and strong. Excellent cup and a memory to Abby. I hope she will make her presence occasionally in future NCIS episodes. I like the cup, it is definitely lore durable than your standard take-out cup, designed for extensive reuse. The straw isn’t great, and points downward at the tip, causing the last few inches of drink to drain out if you’re not careful. I also wish the cup came true-to-size with the huge cup on the show. It is not small, but not a giant cup either. It’s a nice caf pow cup I like using it I’ve got two now.